Dave is a co-founder of Compassionate Action for Animals. Please see his bio for more details. We wanted to let people know that CAA is not organizing Their Lives, Our Voices conference in 2011. We first hosted TLOV in 2008. It was a great event, and we were thrilled at the response from the community. Over the past three years, we've attracted activists from around the country, and hosted great speakers such as Gene Baur, Nathan Runkle, Zoe Weil, and Carol Adams. We've gotten lots of great feedback from attendees, and we hope that TLOV has inspired people to go back to their communities and advocate on behalf of animals. However, this year, we've seen a shift in interest and priorities from the volunteers responsible for organizing our programs. Our volunteers have expressed less interest in organizing TLOV, instead choosing to focus on other programs. We're not ruling out the possibility of hosting TLOV again in the future. If you'd like to help make TLOV happen in 2012, please consider volunteering. Of course, we have many other volunteer opportunities as well. There are many ways you can help animals. If you can't make time to volunteer, please consider making a donation. If you're interested in attending an animal rights conference in 2011, we encourage you to check out Taking Action for Animals or AR 2011. Thanks again to all of the TLOV attendees, speakers, and sponsors from the past three years. Finding vegetarian-friendly restaurants on the go just got even easier! On VegGuide.org, we've made the "Nearby" section of our homepage, which lists nearby vegetarian-friendly restaurants, even more precise by tapping into the power of the latest smart phones. 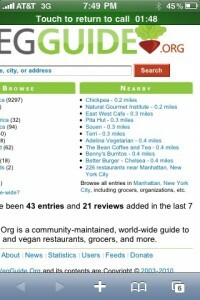 To find nearby vegetarian-friendly restaurants, simply go to VegGuide.org in your phone's web browser. A message may pop up asking you if you wish to share your device's location with VegGuide.org. After tapping "OK" to share your location with VegGuide.org, a list of the closest vegetarian-friendly restaurants should appear in the "Nearby" section of the VegGuide.org homepage. 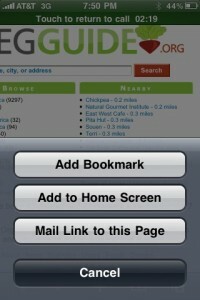 Make sure to put a link to VegGuide.org on your phone's desktop for easy access. You can do this on the iPhone by tapping the "+" button at the bottom of the screen, then tapping the "Add to Home Screen" button, and following the prompts. Now you'll always be able to easily find the closest vegetarian-friendly restaurant wherever you are! When Dee was just 15 years old she decided to stop eating meat and she became vegetarian. As she continued to educate herself more about vegetarianism and animal rights issues, it did not take long for her to transition into veganism. Dee has been active with animal rights and has volunteered at events such as the Thanks Living Festival in New York. After Dee moved to Minnesota, she found CAA on Meetup. It was at Meetup events where Dee met fellow CAA volunteer Jin Dalsin. Today Dee and Jin coordinate the Vegan After Darks. When Dee is not working or volunteering she enjoys nature, reading, yoga, and indulging in great vegan food and wine. 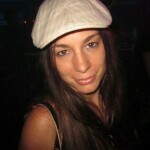 Stop by a Vegan After Dark and introduce yourself to December's Volunteer of the Month Dee Hanson!